Volunteer are our foundation, Friends of Foster Kids need your help! Be a part of our Angel network year-round. Calling all of our wonderful Angel volunteers! We begin our 10th year with excitement and enthusiasm to help even more local foster children this upcoming holiday season! With this excitement also comes the need for many volunteers, from wrappers to organizers and more this Christmas season! We begin Saturday, December 1st and are tentatively scheduled through Dec 21, which may change (cancelled, if we finish early or extended, if necessary). Be sure to include your email and cell phone so we can contact you if there are any last minute changes and PLEASE check your email before coming to your shift/s. Thank you so much for being an Angel and helping make the Spirit of Christmas a success, we couldn’t do it without you!! Let us know where your talents are! Please download the FoFK Volunteer Form and fill it in on your computer, save it to your computer with your name after our file name (so we know it’s yours) and then email it back to Theresa Toia at info@friendsoffosterkids.org. 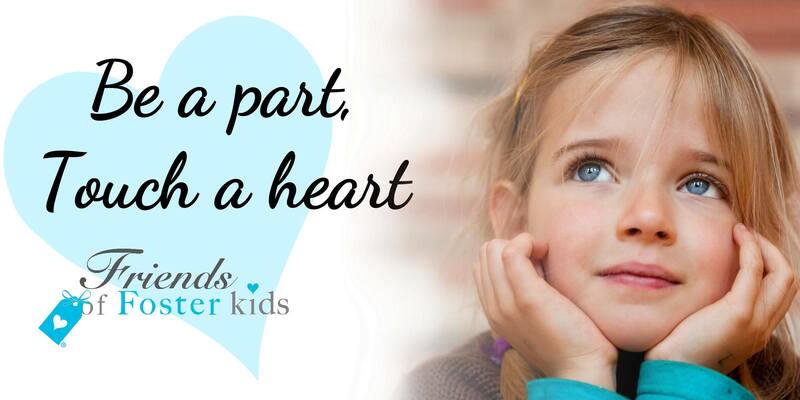 If you would like to find out how you can make a difference in the life of a foster child, please contact us at info@friendsoffosterkids.org and stay connected with us year-round on social media, Follow us on Twitter and Like us on Facebook!